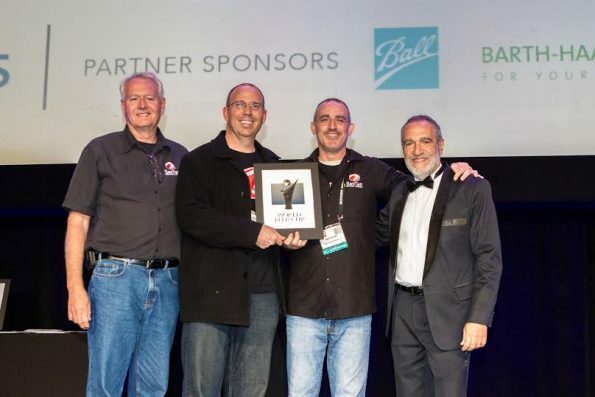 SanTan Brewing claimed a silver award in the 2016 World Beer Cup, a global beer competition that evaluates beers from around the world and recognizes the most outstanding brewers and their beers. SanTan Brewing Company was awarded a silver award in the fruit wheat beer style category for its Mr. Pineapple Wheat beer. Brewed with Rainforest Alliance Certified Pineapple Juice for a more sustainable, socially conscious and tasty can of craft beer, Mr. Pineapple is a refreshing and fruity traditional Wheat Ale. Fresh pineapple is added during the primary fermentation then crushed and cooled to allow the natural flavors to infuse the traditional wheat beer for a refreshing twist. Mr. Pineapple is one of our most popular brews and truly a labor of love. We take pride in sourcing quality ingredients, making for a more refreshing and satisfying beer. On behalf of the entire SanTan Family, we are thrilled to have our beer selected for the silver award,” said Anthony Canecchia, founder and brewmaster, SanTan Brewing Company. Availability: 365 thirst quenching days per year, in cans and on tap throughout Arizona, Southern California, New Mexico and Texas. To find a pint or can of SanTan’s beers near you, visit SanTan Brewing Company’s Beer Finder online at www.SanTanBeerFinder. Check out SanTan Brewing Company online at www.santanbrewing.com and become a fan on Facebook at www.facebook.com/SanTanBrewingCo or follow them at www.twitter.com/SanTanBrewing. ← Previous Previous post: Hard Root Beer Showdown: Who Will Float to the Top?